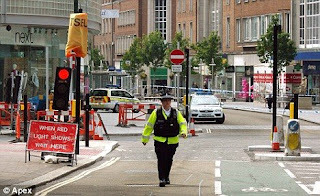 Attempted Suicide Bombing at a British Restaurant! A 22 year-old suicide bomber was the only one injured when his bomb went off early at an Exeter family restaurant- The Giraffe. The restaurant was pretty full at the time of the attack. The 22-year-old man was arrested at the scene. He suffered lacerations to his eye and some facial burning. It was a nail bomb. A restaurant customer has been injured in a suspected nail bomb attack on a city centre restaurant. The exploded shortly after a man entered the Giraffe Restaurant in the Princesshay shopping centre in Exeter, Devon. The customer was taken to the Royal Devon and Exeter Hospital and the area has been sealed off by police. The Times Online and Infidel Blogger’s Alliance have more. It sounds like the man was in a locked toilet when the bomb went off prematurely. …Maybe he was putting on the suicide vest? Get this… Authorities are questioning whether it was an animal rights activist! Special branch detectives are investigating whether the real target may have been another shop in the area, possibly one which sells products which are tested on animals. There have been attacks on shopping centres in the West Country over the past 25 years which have been linked to animal rights extremists. Yeah… Those animal rights extremists are blowing themselves up right and left these days! Pastorius reported that 2 additional devices were found in the area. UPDATE: Guess what?… It wasn’t an animal rights extremist, after all. Bomber is a young white male and a Muslim convert. UPDATE 2: The bomber was identified as Nicky Reilly.